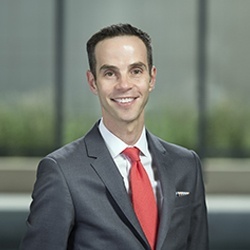 As OMRF’s chief legal officer, Adam Cohen devotes a significant portion of his time to strategic initiatives while also serving as counsel on business transactions, managing litigation matters and ensuring that OMRF complies with laws and regulations in areas ranging from intellectual property to human subjects research. He holds a B.A. in English from the University of Pennsylvania and a J.D. from the Duke University School of Law. Prior to joining OMRF in 2002, he worked as a litigator for the law firm of Hughes Hubbard & Reed in New York, a law clerk to the Honorable Robert H. Henry of the U.S. Court of Appeals for the 10th Circuit and a staff attorney for the University of Oklahoma. Also a writer, he is a contributing editor for Runner’s World magazine, and his work has appeared in more than a dozen other publications, including The American Lawyer and The New York Times. He has served as volunteer legal counsel to the Oklahoma City Memorial Marathon and as a member of the boards of the Oklahoma Society of Professional Journalists, the Norman Public School Foundation and the Norman Community Foundation.